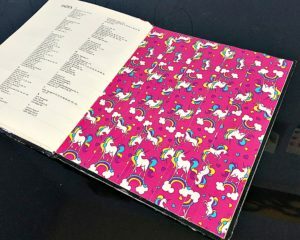 Now that the outside cover was all done, it was time to figure out the inside cover for the journal. I had no idea what I wanted to do, except that there should be color. 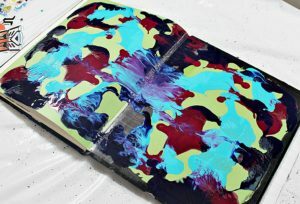 So I took one of my staple color combos – indigo, turquoise, and magenta – and dripped the paint around the inside of the front cover. It was looking… ew… so I closed the cover to try to get an ink blot effect. It *sort of* worked. I figured it was going to be mostly covered with stickers anyway, so I let it dry and pulled out my big ole stash of stickers. Yay STICKERS!!! Did you know you can get packs of 100 or more vinyl stickers on Amazon for about ten bucks? Not promoting anything here, but when I need to make the free shipping (I REFUSE to get prime), those sticker packs are just the best! I went ahead and picked out my faves. I’m talking the stickers I liked so much that I would probably never put them on anything, ever. 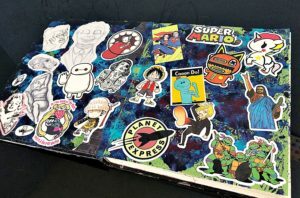 Well, if ever there was a place to put said stickers, it would be on the inside of my journal. After picking out all the good ones (omg what are you gonna think about all the ones that I thought were good?? 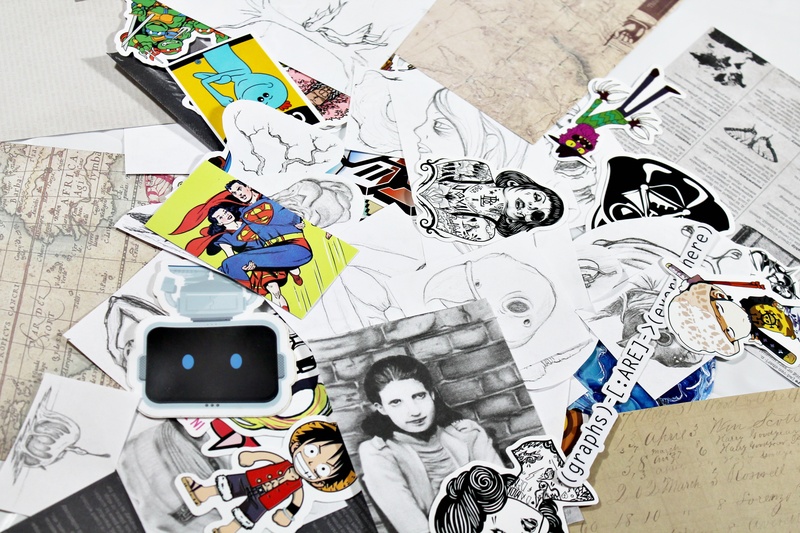 ), I separated them into piles of black and white stickers and color stickers. Then I sort of figured out which ones would go in front and which ones would go in the back. Sort of, because we both know whatever plan existed was going to change part way through anyway. I thought it might look cool to transition from the black and white cover to a more colorful inside. So I put the black and white stickers toward the edges and the colorful stickers in the middle. I’m not sure if that translated, but that’s what I did. Transition! Or another hot mess… STICKERS! When I moved on to the back inside cover, things got a little sticky – pun intended. I used WAY too much paint. When I closed the cover to smoosh it all up, it didn’t really want to let go. Then it started to run, so I dabbed it and smooshed it again. Eventually I got it to some kind of a happy place where paint wasn’t running and pooling everywhere, but it took a long time to dry. Seriously, it felt like FOREVER. It was actually more like I had to leave it overnight and stop working when I didn’t want to (*stickers!*). The next day the paint was still a bit tacky underneath, but that ended up being for the best because I had an idea. I was going to add A POCKET. Not just any pocket. A pocket made out of one of the pages I ripped out! It was another one of those singing angels moments and I’m pretty sure the entire room started to sparkle. After a bit of cutting, folding, and gluing I had a pocket! 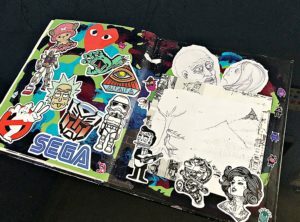 I put some of my leftover sketchbooks scans around it and proceeded to sticker away! I’m pretty proud of that pocket. I may or may not have glued it shut at one point. All that was left at this point was prepping the inside pages, which would probably make for some boring pictures, except maybe for the first and last pages. I had two things that absolutely had to go in the journal. First, there was this big fairy sticker I bought at Hot Topic at least ten years ago. I have no idea why I got it, but I had it for so long it was time to finally give it a home. Onto the first page it went! 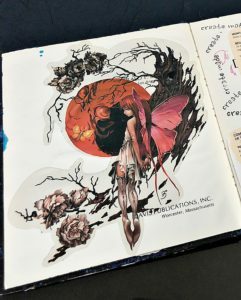 I thought it would be a nice representation of all things past, since by the time I started the journal everything at the beginning would be in the past. This sticker was just the COOLEST THING EVER. I had to do it! The unicorns told me to! There’s just too much love packed in there! Remember where I said pages needed to come out to make room? Protip: Make sure you take out *enough* pages. Watercolor paper especially can be pretty thick. Even though it doesn’t close all the way, I still think it turned out pretty sweet Plus, it’s one of a kind, with plenty of other quirks built into it already! Thanks for sharing this little journey with me. If there’s another project you’d like to see me take a crack at, let me know! Until next time!